The goal of this report is to provide our readers with some important fundamental and technical trends in commodity markets this week. 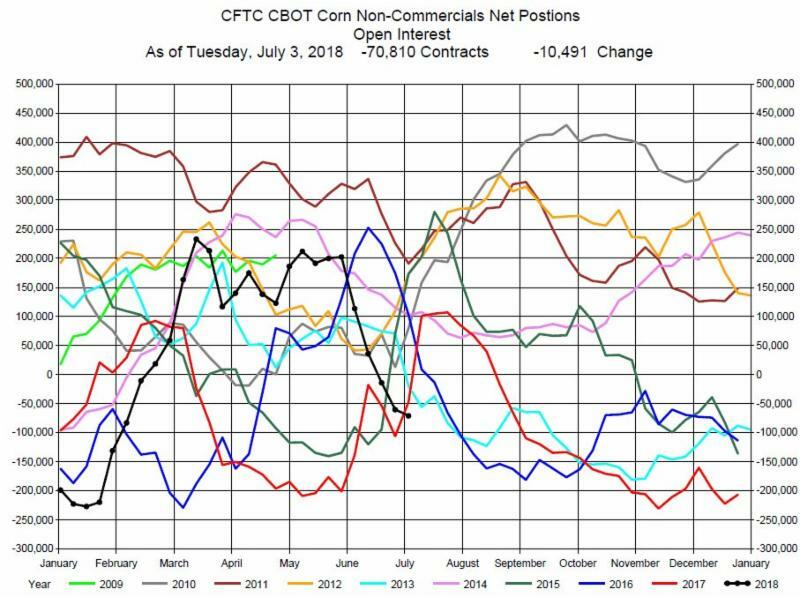 In the latest CFTC report for the week ending July 3rd the funds were net sellers of 10,490 contracts to a short position of -70,810 contracts, as shown in the chart immediately below. 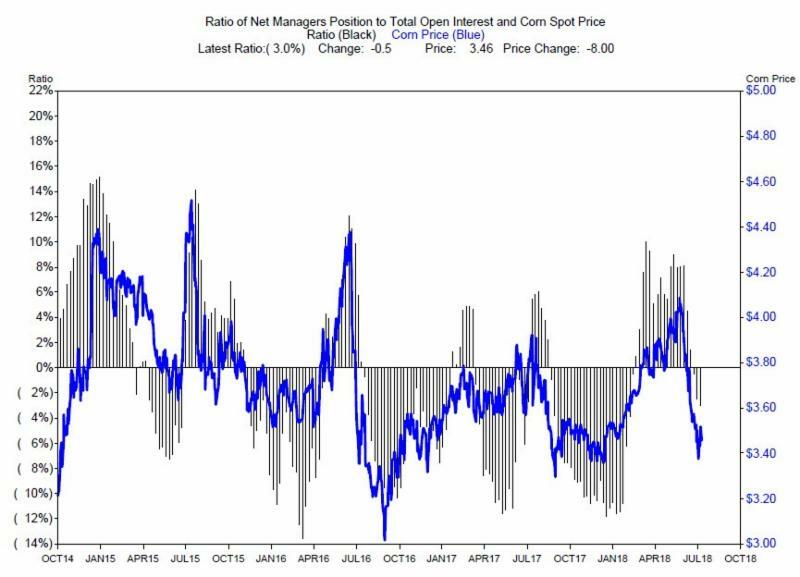 The money managers continue to be bearish price; in the next chart which follows (showing ratio and corn price) the -70,810 contracts represents -3% of the Total Open Interest. It is interesting to note the uniform growth or decline (the gray bars) of the Ratio of Net Managers Position to Total Open Interest. This suggests the Funds will add to their net short positions and add further pressure on prices. For the producer who did not hedge at (say) $4.00 this is a difficult situation. For the trader shorting the September Corn contract has the opportunity for as much as a 40 cent gain; similarly for the December Corn Contract as much as a 60 cent gain. The Sep-Dec Calendar spread also has short side potential. 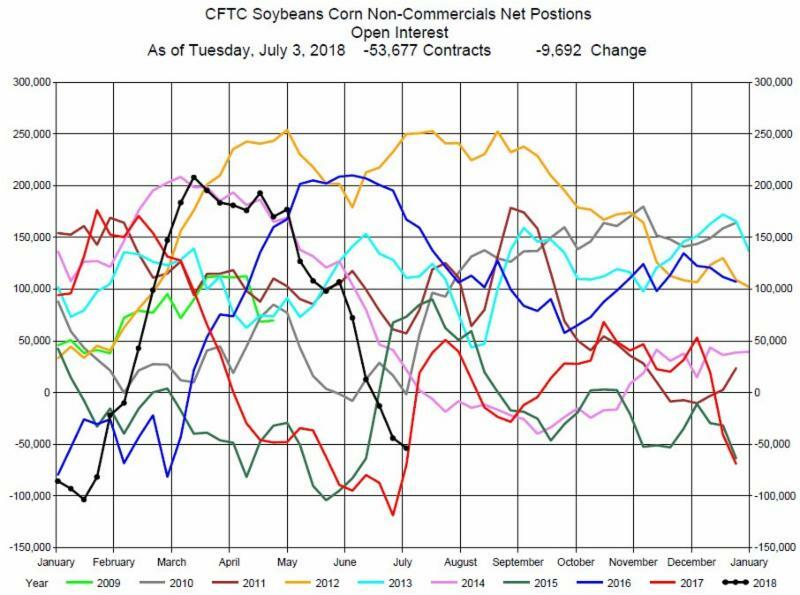 In the latest CFTC report for the week ending July 3rd, the funds were net sellers of 9,692 contracts to a short position of -53,677 contracts, as shown in the chart immediately below. 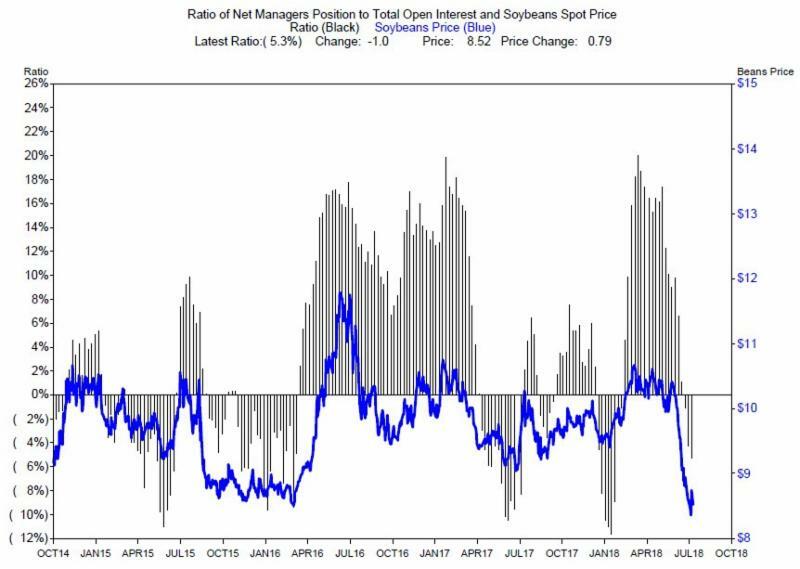 The money managers continue to be bearish price; in the next chart which follows (showing ratio and beans price) the -53,677 contracts represents -5% of the Total Open Interest. Again, it is interesting to note the uniform growth or decline (the gray bars) of the Ratio of Net Managers Position to Total Open Interest. This suggests the Funds will add to their net short positions and add further pressure on prices. For the producer who did not hedge at (say) $10.00 this is a difficult situation. For the trader shorting Soybeans this is a problematic situation. The current contracts are all at recent record low prices – see the blue price line in the chart below. To a trader it may seem counterintuitive to short a market at its low, this seeming instead to be a long trade opportunity. However, the Funds are often momentum followers so they may “Sell at the low, Buy back lower.” From a speculative trader perspective this may be a period of no Soybeans trade and just observing the Funds. Surprisingly, Gasoline prices have not increased as fast as the recent increase in Crude Oil Prices. With the recent rise in Crude Oil prices we would expect a similar rise in Gasolilne Prices. 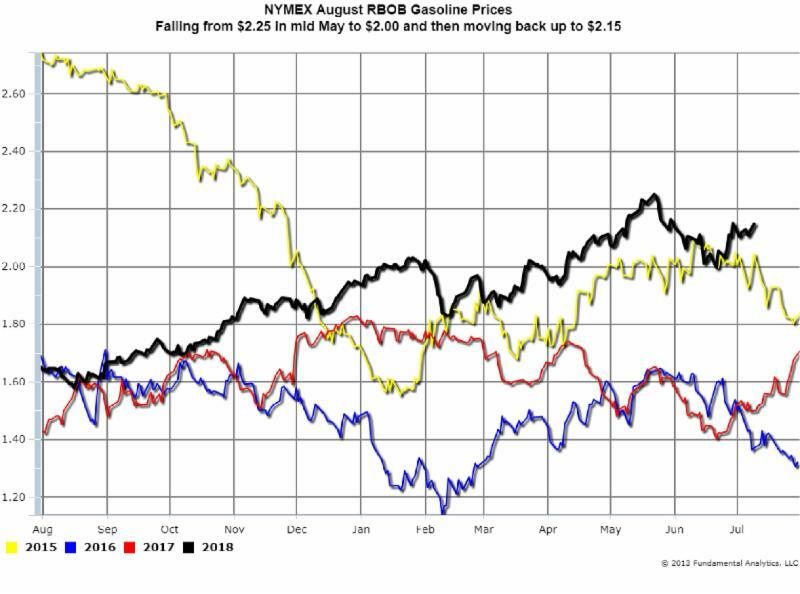 In the chart below we note that August Gasoline RBOB contract dropped from $2.25 in mid May to $2.00 in mid June (an 11% drop) and then recovered to $2.15, a 7.5% recovery. 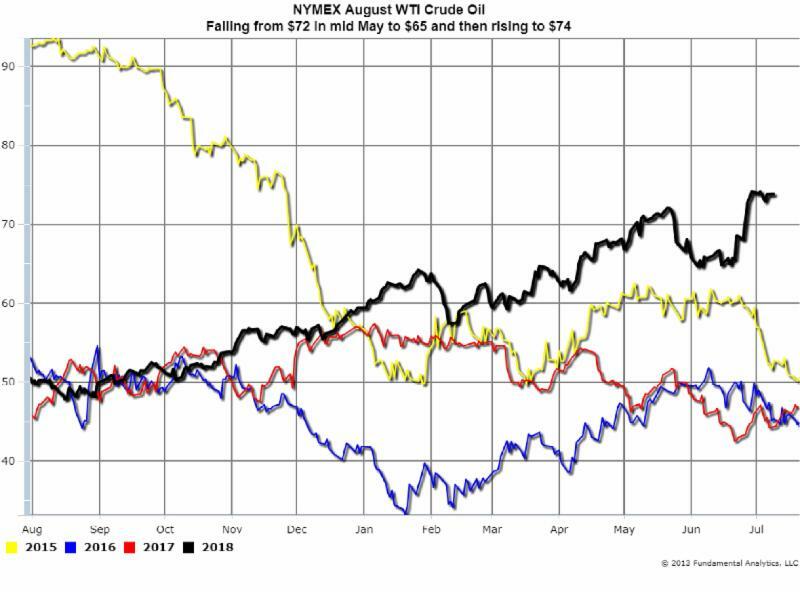 During the same period the August Crude Oil Prices dropped from $72 in mid May to $65 in mid June (a 10% drop) to recover to $74, a 13.8% recovery. Consequently, the Refiners’ margin did not increase at the same rate as Crude Oil prices increased. 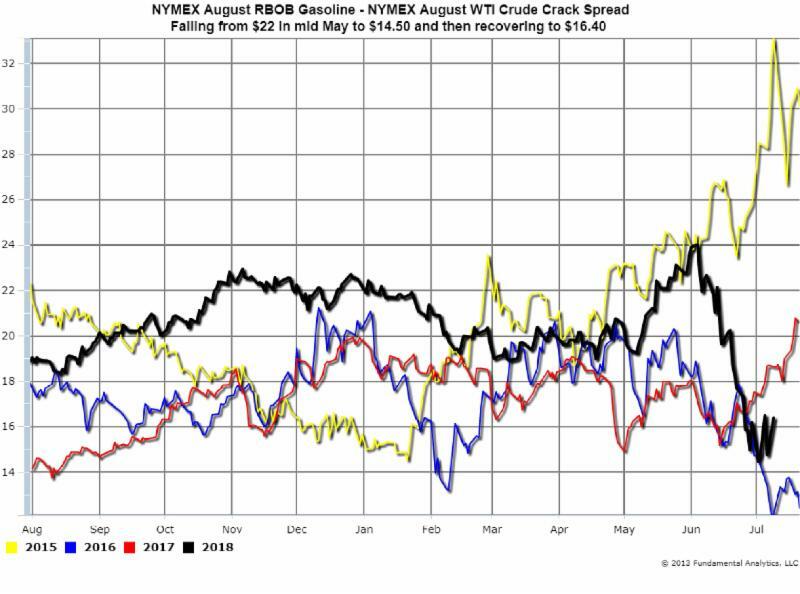 The Crack Spread of August RBOB Gasoline price minus the August WTI Crude price went from $22 in mid May to $14.50 in mid June and then recovered to $16.40, a 13% recovery.